Old Meadows Park at 1600 Marview Drive, Thousand Oaks houses the Therapeutic Recreation Unit of the Conejo Recreation and Park District, which provides recreation programs for Conejo Valley residents with disabilities. The park includes a one-of-a-kind "SensAbility Playground", an interactive play area stimulating senses and abilities. 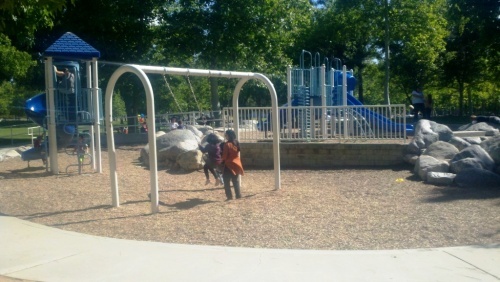 The playground contains mat surfacing, rolling turf hills, large shaded areas, tree log swings, seagull swings, harmony chimes, hammocks, pod seats, picnic tables and many other cool features. The area also features a butterfly garden, physical development apparatus with features that encourage climbing, crawling, jumping and so on, sensory processing and calming features and features that encourage socialization. There are active and passive play areas allowing children to engage in stimulating activities, and areas to which they can retreat and calm themselves after anxiety-producing experiences while remaining close by to other children, parents or caregivers. The playground features many unique play pieces including "Playville" miniature village, elevated sand table, "Sand Works", one back hoe digger, Tenor Marimba (a xylophone-like musical piece), Talking Bob, talking horns, a sign language panel and several sensory panels. Located at 3700 Avenida Simi in Simi Valley, Rancho Tapo Community Park al is hidden away north of the 118 freeway between Sequoia Avenue and Tapo Canyon Road. The park has something for everyone, including several play areas, splash pad*, covered area for gatherings, nicely appointed fitness circuit area, playfields, basketball and a peaceful Veterans' Plaza with pond in memory those who have served. Best of all, this is a very flat park with a nice, 1/2 mile walking path that the kids enjoy riding their scooters on. We like this park! Visit www.rsrpd.org/simi_valley/parks/rancho_tapo_community_park_%28lemon%29.php for more information. * A new, 55% larger splash pad area, with a water treatment and recirculation system, opened in May 2015. Oak Canyon Community Park is located at 5600 Hollytree Drive in Oak Park at Kanan. This is a nicely appointed park with a children's splash pad, playgrounds, lagoon/pond with ducks, dog park and plenty of open space. More information on the Rancho Simi Recreation and Park District website at www.rsrpd.org/oak_park/parks/oak_canyon_community_park.php. The Oak Park Dog Park at Oak Canyon Community Park opened in May 2010. It is open from 7am to dusk every day (closed 7am to 10am for maintenance on Fridays). For more information, visit www.rsrpd.org/oak_park/parks/oak_canyon_dog_park.php. Oak Canyon Dog Park on a non-busy day. Chase Palm Park in Santa Barbara is a huge park that sandwiches East Cabrillo Boulevard. On the ocean side of Cabrillo the park consists of a palm-lined, narrow strip of park adjacent to East Beach with an oceanfront bike path and walkway from Stearns Wharf to East Beach. This side of the park is host to Sunday/holiday arts and crafts shows. The 14,600 square foot Skater's Point skate park is also located on this side of the park. Call 805.564.5418 for more information or visit www.santabarbaraca.gov/gov/depts/parksrec/parks/features/playgrounds/chase.asp. On the other side of Cabrillo is a huge 10 acre parcel that features fountains, creeks, a lagoon, carousel, snack bar and a shipwreck playground modeled after an ocean schooner from the turn of the century. The park is walking distance to Stearns Wharf, the beach, bike rentals, State Street, etc. From 1999 to 2017, the park was home to a vintage 1916 40 foot in diamater carousel, The carousel was relocated to Fort Hood, Oregon to a museum. The Oxnard Beach Park is located on South Harbor Boulevard, South of Wooley Road and next to the Embassy Suites Mandalay Beach Hotel and Resort in Oxnard. The park has an awesome, large pirate-themed play area. There is a larger structure for 5 to 12 year olds and a smaller one for younger kids. This park is just a short walk to the beach, where you and the kids can spend time digging holes, building sand castles and running from the waves. The park is also in close vicinity to Channel Islands Harbor. The park has a large grassy area, restrooms, BBQ grills, bike paths, etc. There is a parking fee at this park; just $1/hour or $5/day. For more information, visit www.oxnard.org/parks-faq/#. 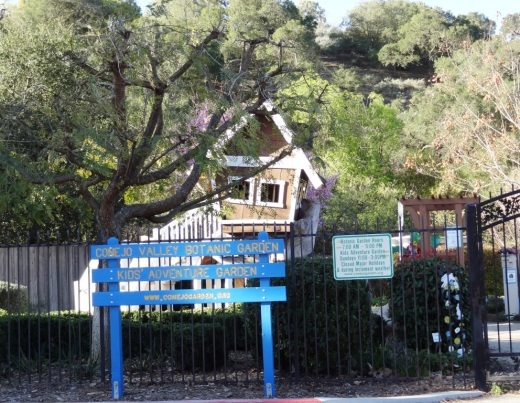 The Kids' Adventure Garden (KAG) at the Conejo Valley Botanic Garden is open every Sunday from 11 a.m. to 3 p.m. The KAG provides an exciting place for children to learn about nature and gardening. The garden features a tree house, pirate's cave, zoo garden, hydroponic pod and much more. Free. Enter at 400 W. Gainsborough Rd. between Lynn Road and Moorpark Road in Thousand Oaks. Kids love running around the KAG and exploring the nearby trails and stream. 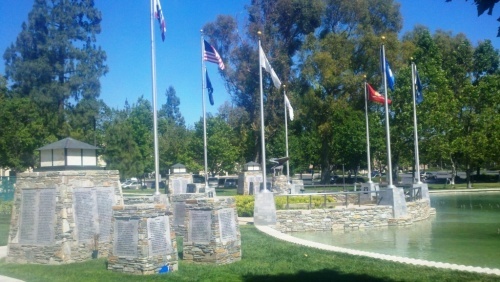 Additionally, the kid-friendly Conejo Community Park is nearby. Visit www.conejogarden.org/KidsGarden for more information and pictures. Additionally, a Native Plant Nursery is open at this location on Sundays. KAG is also available for birthday parties on Saturdays for a donation. Call 818.889.0560 for more information. The City of Calabasas' Juan Bautista de Anza Park at 3701 Lost Hills Road (corner of Lost Hills and Las Virgenes) has facility and recreation space available for rent. The rental space is ideal for birthday parties, holiday gatherings, corporate picnics, or company retreats. There are three separate age appropriate play areas, a water fountain that shoots water streams eight feet into the air during the summer and a large sport court. This is a fun park that my kids always enjoy! Access to trails too! Three large picnic areas are available. Each area seats 80 (240 combined). The park’s game and basketball courts may also be rented for party use. A multi-purpose room with panoramic views are also available for rental. More information at www.cityofcalabasas.com/recreation/deanza.html or call 818.880.6461.